If you want to see Mt. Fuji, you have two options. One way is to go to a Mt. Fuji viewing spot such as the popular Lake Kawaguchi area. The other is to climb Mt. Fuji and experience the mountain firsthand. This article introduces a third option, which is staying near Mt. Fuji. At PICA Fujiyama, a campground operated by PICA Resort, you can enjoy Mt. Fuji as much as you want in a way that's easier than mountain climbing and more memorable than viewing it from far away. PICA Resort has more than twenty years of history operating campsites, with ten locations in the Kanto Region, including Shizuoka, Yamanashi, Saitama and Kanagawa Prefectures. PICA Resort has a lakeside site and even a campground located by a theme park. Various accommodation types such as tents, cottages and camping cars are offered to satisfy all types of travelers. PICA Fujiyama opened in 2018 and is the newest campsite operated by PICA Resort. PICA Fujiyama, located at the foot of Mt. Fuji, is a large campsite covering 50,000 square meters. Surrounded by nature, it is a picturesque hideaway tucked in the middle of the forest. The concept of PICA Fujiyama is for travelers to enjoy the outdoors and get in touch with nature. The campground was created to make camping accessible even for beginners. Some people may feel insecure about putting together a tent, sleeping inside one, or preparing meals while camping. PICA Fujiyama offers a wide variety of accommodations so that even first-time visitors can have a comfortable and fun stay. Camping site PICA Fujiyama offers four categories of accommodations. 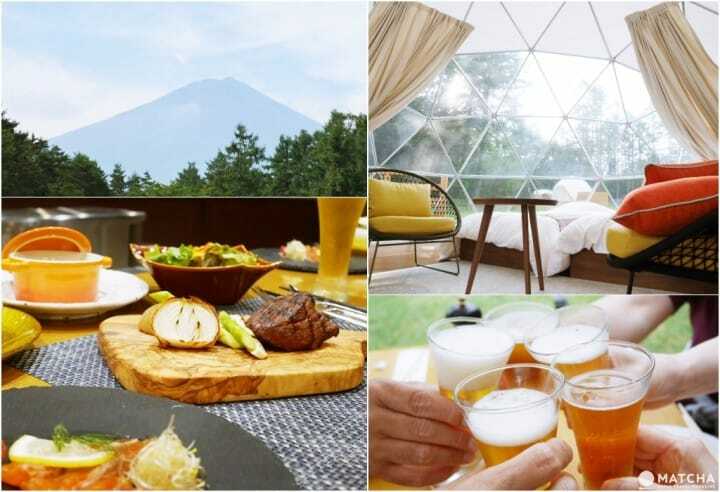 The Amazing Dome accommodations are the white tents on the green grass fields, designed by PICA Fujiyama. Part of the tent is transparent so that campers can enjoy the surrounding landscape. With the lights on at night, the dome looks like a star from the Milky Way. Campers can watch the night sky from inside the dome, creating a romantic and unique experience. This is the only accommodation equipped with a bathroom. There are two cottage types: standard and luxury. Both come with air conditioning. The interior is spacious, with windows on the walls and ceiling, allowing ample sunlight to filter into the room. Guests can enjoy the outdoors even from inside the cottage, making this an accommodation suitable for guests without camping experience. PICA Fujiyama designed this large trailer house-type cottage, equipped with a bed, sofa, dining table, and air conditioning. It also has a roofed terrace, perfect for a barbecue or just relaxing. The comfort of indoors is only a few steps away with this type of lodging. This type is recommended for those who wish to camp with a peace of mind. This is for experienced campers who can build their own tents. You can bring in your own tent or rent one from PICA Fujiyama. There is a roofed deck near this area where the campers can enjoy barbecues. Market and Restaurant - Don't Worry About Food! At PICA Fujiyama, all accommodations except the Amazing Dome are equipped with kitchens. Campers can cook their own meals, or with an extra charge, eat at the restaurant on-site. The market at PICA Fujiyama Center House sells everything neccessary for a barbecue, from wood to meat to alcoholic beverages. Be sure to buy some marshmallows for the campfire. Campers who choose not to cook can head to the restaurant at PICA Fujiyama Center House, which serves breakfast and dinner cooked with seasonal ingredients. The dinner comes with an appetizer, soup, main dish, and dessert. Breakfast consists of fresh fruit, salad, bread, and hot soup, giving you the energy needed to start the day! PICA Fujiyama is in an ideal location, right under Mt. Fuji, providing close-up views of the ever-changing mountain. Early in the morning, Mt. Fuji is usually shrouded in clouds. By noon it is bathed in sunlight, and the view changes along with the setting sun. The mountain ridge line will disappear at night. Instead, the mountain trail will become illuminated, hinting at the number of climbers on Mt. Fuji. At PICA Fujiyama guests can enjoy different views of Mt. Fuji throughout the day. This facility is in the center of the campsite. It is easy to access and there are many maps showing its location. The Center House handles all the campsite service and information. Campers can make reservations for the restaurant and activities, aided by the friendly staff. At the market, you can find food products, Mt. Fuji-related souvenirs, and local goods. The shower room and coin laundry are also located in the Center House. The lounge area, equipped with sofas and firewood, is popuar with guests. Campers can use the lounge at any time of day and listen to the birds, or read some books. PICA Fuji Saiko Lake, also operated by PICA Resort, is located next to Saiko Lake. This is the only lake in Fuji Goko (five lakes) that does not allow electric motorboats, so campers at this site can appreciate the serene atmosphere. A guide will be on board during the tour, to help with paddling the canoe. There is no need to worry, even if you are a beginner. The slow movement of the canoe, along with the cooling breeze and occasional splash of lake water will make a memorable summer experience. The campers can also go hiking on Mt. Fuji! Most climbers start at the fifth station of Mt. Fuji, but this hike starts at the bottom. While the climb from the fifth station is restricted in some seasons, there is no such restriction for this hike. The trail is not too steep and is surrounded by green, which is rare beyond the fifth station. This hike will change your perception of Mt. Fuji. A professional guide will accompany the hike, and the site has a rental service for hiking materials including mountain-climbing boots, backpacks, and hiking poles. During the hike, climbers will receive a detailed lecture about the history and the surrounding environment of Mt. Fuji. Lunch and beverages will be also served. The lunch after the hike will be very special, as it is a rare opportunity to dine in the wilderness of Mt. Fuji. The hike will be conducted mainly in Japanese, and with some simple English. PICA Fujiyama offers activities such as star watching and different workshops throughout the year. For further information, please take a look at their official site (Japanese). Oshino Shinobi no Sato is a ninja-themed park located near Lake Kawaguchi. At this park, visitors can dress up as a ninja, watch the Ninja Show, or try their skills at the Shuriken Dojo. An ideal plan would be to visit Oshino Shinobi no Sato in the morning, check in at PICA Fujiyama, and enjoy the activities on the next day. If you want to appreciate both Japanese culture and the beauty of Mt. Fuji, be sure to head for PICA Fujiyama! Kawaguchiko Station. Get off at "PICA Fujiyama"
The timetable can be seen on this page.